How Will Virtual Reality Marketing Evolve in 2019? Virtual reality is taking the world by storm. The futuristic technology that can drop viewers into different visual environments has taken off and is growing in popularity every day. And, as is always the case, wherever the consumers go, it doesn’t take long for companies, and particularly marketers, to follow. How are marketers taking advantage of this exciting new trend? Let’s take a quick look at how VR is already being used for marketing and how things could change throughout the next year. Fun fact: Experts predict that virtual and augmented reality are going to have a whopping $30 billion impact on the economy by 2020. How’s that for attention grabbing? That’s a solid chunk of business for any enterprise, which begs the question: How are companies taking advantage of this rising tide of virtual reality across the economic landscape? While 2019 promises to be a year that will see rapid change in the world of virtual reality, we’ve already reached the point where businesses from many different industries are applying the technology to their marketing efforts — and we’re not just talking about a few trend-setting companies like Apple or Google. There is already a whole slew of big-name companies that have been busy rolling out new VR marketing platforms. Lowes, for example, has created the “Holoroom,” a one-stop shop for all DIYers to learn new skills. This exciting application of VR abilities allows potential customers to get a virtual hands-on experience, walking around the room with a VR headset on as they’re instructed to do anything from painting to tiling, to installing floors, and so on. The memory recall of these virtually experienced instructions tends to be over a third higher when using the Holoroom when compared to traditional YouTube videos (can we call those “traditional” yet?). Virtual reality is also revolutionizing the real estate market by equipping companies with the ability to conduct tours of various properties from an aerial view. This has proven to be extremely valuable, as the interior of a house is almost never the sole deciding motivator for those purchasing a new home. Factors like where the house is located, what the neighborhood is like, and even what the view is from the front yard can all be important as well, all of which become possible through the new use of VR. Another excellent example is the shoe brand Merrell, who partnered with Oculus VR to create a 4D, virtual reality, experience that involved tactile elements and even included rock slides, all of which helped promote their new, cutting-edge TrailScape hiking shoes. Needless to say, virtual reality has already been busily shaping the marketing landscape, and it’s promising potential means this influence isn’t going anywhere any time soon. On the contrary, it’s likely to only continue to gain importance in 2019. According to Rutgers, 70 percent of consumers make brand decisions in the store. This puts virtual reality in a perfect position for the future, as it can, in essence, transport consumers directly into a store scenario. This allows companies using VR to literally take the online e-commerce model that companies like Amazon have so successfully proven to work and marry it to a uniquely innovative “in-store” experience, allowing VR users to peruse the aisles and even pick up and observe virtual versions of their products. While the technology to perfect this experience is still being developed, its arrival in the marketing sphere is palpable at this point. In addition, things like virtual dressing rooms can allow potential customers to try on clothes from the comfort of their own home. Amazon has even patented a mirror version of this concept. Virtual furniture can allow a buyer to use augmented reality to see what a piece will look like in their home before adding it to their cart as well. 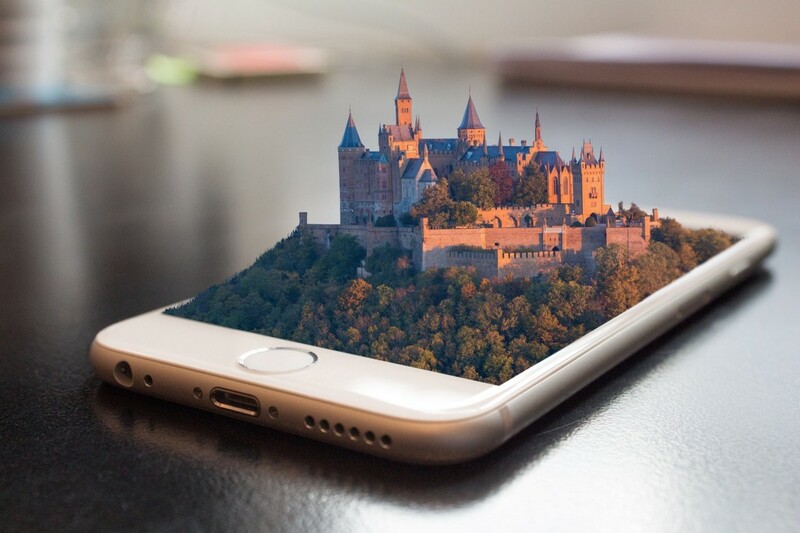 While the advancements in both virtual reality, as well as its cousin, augmented reality are undeniably growing in both popularity and application, the one question that remains is how smaller companies (e.g. not the Apples and Googles of the world) can start to plan VR into their own marketing schemes. First off, keep an eye out on social media platforms like Facebook and Snapchat. Many of these are working overtime to incorporate virtual reality concepts into their platforms, which will open the doors for businesses to use their services to promote their own VR ads. When it comes to figuring out how your specific company may want to go about fitting either VR or AR into its plans, remember that this is just a piece of the modern market. Therefore, it behooves companies to find ways to incorporate any new VR efforts into existing marketing that will complement the rest of their plans. One excellent way to do this is by using the power of a VR ad to sell an experience rather than the product itself. Tell a story, get interactive, and use the power of the encounter itself. The nature of this encounter will depend largely on your audience. What are the specific needs, most common questions, and pain points of your target demographic? Considering these facts, how can VR experiences inspire interest in your products or your brand? Using analytics to inform your marketing can bolster the potential of VR in your marketing campaign. If you’re looking for more information on how to use VR in your marketing, you can find more information on starting your first successful virtual reality campaign here. There’s no doubt that virtual reality is here to stay. From better technology to a growing number of applications, the virtual 3D experience is becoming a mainstay of life in the 21st century. And this, naturally, includes an evolution in marketing efforts to meet consumers as they shift their preferences and habits. The good news is that it hasn’t taken long for larger companies to blaze the trail, demonstrating how the new power of virtual reality can be applied to commerce and, in the process, opening the doors for a whole host of new uses going forward into 2019 and beyond. How Will Virtual Reality Marketing Evolve in 2019? was originally published in Marketing And Growth Hacking on Medium, where people are continuing the conversation by highlighting and responding to this story.